I received this in an email today and it spoke deeply to my heart. These are the very things that we are struggling with right now, and we are grasping to understand what God is doing to us. As my wife and I carefully go through the Book of Job, we can easily read our own present experience in Job’s travail and questioning. There are so many closed doors that have been slammed in our faces that it is obvious that this is something that has been engineered and is not by chance or coincidence. Everything has been cut off; all opportunities are closed; nothing works for us like it used to. And just when you think it is too bad, then some minor tragedy takes place to further drain your vanishing money. Next we will hear that the Sabeans have run off with the camels. What is going on? And why? Did I do something wrong, or is God just tired of me? What am I supposed to do next? Which way do I go? This valley is so dark that we cannot see where to place our next footstep, and we are clueless as to which direction we should go in. Is God finished with me or is this just a test; a trial that we will finally come through as fine gold? I could handle this if I just knew what was going on, but all I hear is silence from the Throne. When I got this email which spoke so loudly to me, my first thought was of you, the reader. How many of you out there are also facing the same kind of thing and are crying out to God for a reason why? I felt it would be good to pass this along and share it with you, because if you are not going through this right now, know for certain that if you are serious about serving the Lord, you will face this sooner or later. And it would be good to know that it is not some strange fiery trial that is not common to us, but that it is all part of His plan for your life. IF God has called you to be really like Jesus He will draw you into a life of crucifixion and humility, and put upon you such demands of obedience, that you will not be able to follow other people, or measure yourself by other Christians, and in many ways He will seem to let other people do things which He will not let you do. The Lord may let others be honored and put forward, and keep you hidden in obscurity, because He wants to produce some choice fragrant fruit for His coming glory, which can only be produced in the shade. He may let others be great, but keep you small. He may let others do a work for Him and get the credit for it, but He will make you work and toil on without knowing how much you are doing; and then to make your work still more precious He may let others get credit for the work which you have done, and thus make your reward ten times greater when Jesus comes. The Holy Spirit will put a strict watch over you with a jealous love, and will rebuke you for little words and feelings or for wasting your time, which other Christians never feel distressed over. So make up your mind that God is an Infinitely Sovereign Being, and has a right to do as He pleases with His own. He may not explain to you a thousand things which puzzle your reason in His dealings with you, but if you absolutely sell yourself to be His servant, He will wrap you up in jealous love, and bestow upon you many blessings which come only to those who are in the inner circle. Settle it forever, then that you are to deal directly with the Holy Spirit, and that He is to have the privilege of tying your tongue, or chaining your hand, or closing your eyes, in ways that He does not seem to use with others. Now, when you are so possessed with the living God that you are, in your secret heart, pleased and delighted over this peculiar, personal, private, jealous guardianship and management of the Holy Spirit over your life, then you will have found the vestibule of Heaven. When you are forgotten, neglected, or purposefully set at naught, and you smile inwardly, glorying in the insult or the oversight because thereby you are counted worthy to suffer with Christ, that is victory. When your good is evil spoken of, when your wishes are crossed, when your taste is offended, when your advice is disregarded, when your opinions are ridiculed, and you take it all in patient, loving silence, that is victory. When you are content with any food, raiment, climate, society, solitude, or any interruption by the will of God, that is victory. I’d like to say something about the miracles we’ve been seeing. There have been a lot of incredible miracles, especially on this trip. They have ranged from the blind and deaf to issues of blood and paralysis. There have also been a few that are a little too weird to relate here. But the focus of my campaigns out here is not about miracles – it’s about revival. Miracles are wonderful and are God’s seal of approval on your ministry, but miracles do not convert the soul, change your heart, or save your soul. Only the Word of God can do that. 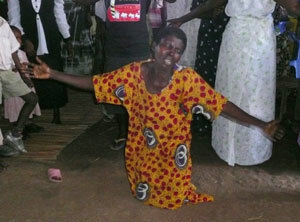 When I went to Nigeria a few years ago, the Lord told me, “No miracles. If you do the miracles, they will not hear the message.” Just like that. Right out of the clear blue air. I got the message loud and clear. I believe that this is the real problem with these huge international healing ministries. They get focused on the wrong thing, become enamored with the blessings, and forget the purpose for which they were called – to preach the Gospel and win souls – and they end up making a circus of a very holy gift from God. Instead of leading the Body of Christ to the altar so that God can move in our lives and in our churches, they instead are leading us in another direction, away from the altar of repentance and toward a focus on self – what blessings God will give me, what is in it for me, what problems that I want God to fix … gimme, gimme, gimme. I call it the Gospel of Me. But no revival comes without deep, broken-hearted repentance at the altar. So instead of bringing health to the Church, they are leading them into folly like a Pied Piper playing an alluring but dangerous melody. Nevertheless, it is gratifying to see real, honest-to-goodness miracles happen right in front of your eyes. It may seem that I’m excited about it, but you should see the look on the face of someone who has really been healed of some disease, or pain, or crippling infirmity when it is gone, completely gone, eliminated, whoosh! Then there are the people who, when you touch them, you can feel the anointing flow. I can’t explain it, but you know that something special just happened to that person. Some of them shake, some swoon, some sway back and forth, and some just melt, but all of them are irrevocably affected. You know God has done something to them that goes deeper than the flesh and into the issues of the heart. They have, on some deeper spiritual level, been changed. On this trip I have witnessed the blind to see, the deaf to hear, the crippled to walk, and a myriad of other diseases and infirmities healed, but I think these spiritual anointings, while very mysterious, are the greater miracles. These things don’t happen naturally, not even here in Africa, but when the oil starts flowing in the service, you can feel the Anointing in the air … and that is even more exciting. Perhaps there is something here that is related to the finger of God preparing hearts to receive this coming revival. Who knows? Certainly I don’t. I just show up and am watch as God deals supernaturally with His people. But I sure am glad to be here to see it. 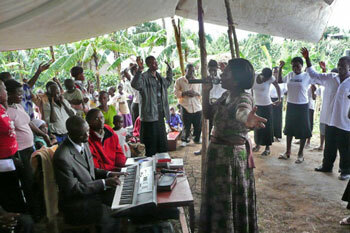 We are way off the main road in western Uganda, holding our revival services in a church right on top of a mountain overlooking the Queen Elizabeth National Park. The road up here to this church is narrow, winding, and full of ruts and holes. Lord help us if it rains! You got to wonder where the people are going to come from (actually, I wonder this almost every time), but so many people have come ( between 200 to 300) that they have to stretch a huge canvas supported by poles outside the church to accommodate everyone. This is a long hard walk up a steep mountain for these people to get here, but I don’t think any of them care. They just want to hear the Word of God. When you look out over the crowd, the Scripture from the Beatitudes really hits you, “Blessed are the poor in spirit for theirs is the Kingdom of Heaven”. These people don’t have all the scintillating distractions we have in America, so their souls are open to the Kingdom of Heaven. What a very different thing we have here! The first couple of services in these meetings are always hard. I have to snap their illusions and bring them to a realization that “church as usual” is not good enough. No matter how good they think their church is, if souls are not coming to the altar in any real numbers, they just simply do not have a revival – they just have church. It is not hard to convince them. They already know this, and that’s why they are here. The hard question is not whether they are satisfied, but whether they are willing to pay the high price that is required to bring a true, Holy Ghost revival. My core Scripture is always Rachael’s Cry from Genesis 30:1, “Give me souls, lest I die!” You have to want it so bad that you are willing to die — to give your life — to see souls get saved. Anything less and you will not be willing to do what it takes to have a real revival. They don’t care. They were willing to walk up the side of a mountain to get here and they are willing to do whatever it takes to have a revival. It’s like they are right in the palm of my hand, sitting on the edge of their seats, taking in everything I tell them. Just keep telling them more … and please don’t stop. Lord, where have You been hiding these people? A wrinkled old woman has pushed her way through the crowd to where I am sitting and kneels down in front of me. She is jabbering away like crazy and pushes a 1,000 shilling note in my hand. That’s about 40 cents, but you can bet it’s a lot of money to her. She keeps pointing at her arms and her veins – something about her blood or something – and then just up and hugs me in a bear hug. Apparently, this old woman had been very, very sick for a long time but the Lord had told her that if she would just come to the service, He would heal her. It must have been a struggle to climb all the way up this mountain, but she came in while I was praying and, sure enough, as soon as she walked in under the canopy, she stepped into a cloud of the Holy Ghost and God healed her. That was one excited old woman! 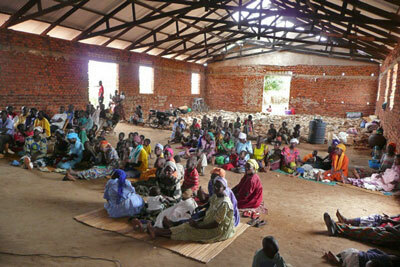 This church is pastured by Noah’s sister, Ruth, and her husband. Ruth can sing. I mean like, really sing. During the song, “Jesus, Be Thou Glorified”, she touched places in my heart that have not been touched in 40 years. I was floating way out there somewhere in the Spirit … and didn’t want to come back down. Pastor Noah’s whole family is royalty. That’s the impression the Lord gave me about them today. The father and mother were having revivals in Uganda during the early 70’s when Idi Amin threw them both in jail, leaving 9 little kids to fend for themselves in the bush. An oppressive culture of fear had swept over the land and everyone was afraid to help them. The father, Elijah, thought he’d never see his children or his wife again. The oldest, just a young teen-ager, was taken and thrown in jail, and the 2nd oldest thought he would be next, so at 10 yrs. old, he left for the streets of the city where he became a street kid for years. The younger kids were scattered because the government took their home. They were finally delivered, but what a price to pay. They never forsook their faith in the face of imprisonment, torture, and the destruction of their family. God spoke to the father and told him not to despair, that all his children would be preaching the Gospel, and he would see revival come to Uganda with his own two eyes. It has happened just like God told him – all his children are in ministry, and here I come along with this hard-hitting message of revival accompanied with this special anointing like he hasn’t felt since the 70’s. You can just imagine how excited he and his wife are. These people have paid a price that I can’t even hold a candle to. I look at them and I see a family that is royalty in God’s family. God has made his children princes and princesses. I feel like a mongrel in comparison to them. My guess is that there’s a lot of this here in Uganda. I reckon we will be surprised to see who is really who when we get on the other side. Wow. Services today were beyond belief! It was like something you read about in a book about revivals. Something broke through today and these people will never be the same. 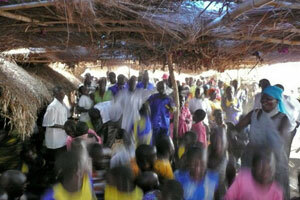 This has been Day 4 in a village called Kihihi, way out on the western edge of Uganda. Zaire is only a few miles down the road. There are gorillas somewhere around here that tourists come to see, but other than that, while it is not exactly remote, this place is pretty rural. Nobody ever comes here to hold Gospel meetings, never mind a white guy from America. But then, these are the kinds of places that the Lord has been sending me to for six years now, so what else is new? People have been coming from everywhere, filling the place up. 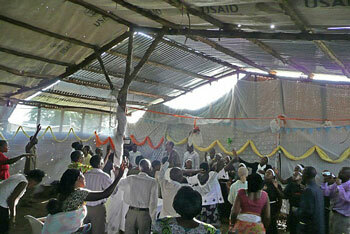 The church is a rude affair of sticks cobbled together to form the walls and roof and covered with a huge plastic tarp that has “US Aid” printed all over it. When it rains, it leaks all over. But that doesn’t stop anyone – they just keep coming. For three days the intensity has been increasing. Services start at 10 am and last straight through until 2 pm. That includes lots of singing and praying out loud and not one, but two messages from me. Then we come back after lunch at 4 pm for the 3rd service, and then immediately go into the open air crusade outside until late at night. 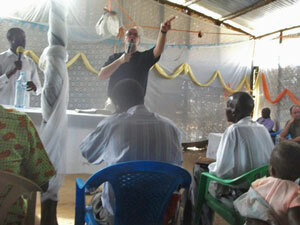 I go back to the hotel after the 3rd service to recharge my battery, but Barry goes out to preach at the crusade. 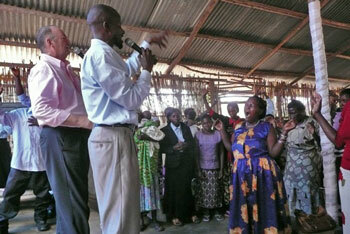 Two hundred souls have been saved here in the last few days – that’s 200, as in two hundred! The excitement in the air can be felt in the reverberations that come from the praying … no, praying is not quite a strong enough word … more like intense war, the thick of combat, the smoke of battle and the victory that only strong faith can lay claim to. 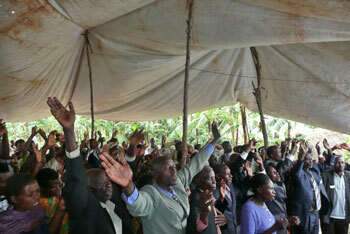 Our revival prayer meetings back in the States are anemic in comparison. And this is just during the regular service! When I call for repentance and rededication at the end of the message it is like unleashing a storm! You just cannot imagine what it is like unless you are here to experience it. Just ask Barry when he gets home. He has never seen anything like it. Tonight was the last service for me. Before leaving, I wanted to at least have a time of prayer for healing sicknesses, both physical and spiritual. Pastor Noah started off by asking for testimonies, and a whole bunch of them came up to tell the things that had happened to them – some spiritual, some about the things they had learned, and some about how they got healed during the services. And THEN we started the healing line. I didn’t really know what to do, but I had heard somewhere about a guy sticking his fingers in a deaf person’s ears and praying over him. Sounded like a good idea to me, so that’s what I did. I even popped my fingers out of his ear for a dramatic effect. (Was that supposed to help?) Nada, nope, nothing. Still can’t hear. Not to be denied, I prayed again (this time without the finger popping), and I prayed hard. Pastor Noah started walking backwards from him, “Can you hear me now?” “Yes”. And so on, all the way to the back of the church. Way back there, I could barely hear Noah, but this deaf man heard him perfectly! Am I jazzed? Ya think? 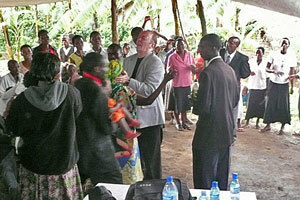 Somewhere about 20 to 30 people got healed – almost everyone that came up. Yes, there was one boy with a large tumor that, when I prayed over him, did not disappear. Maybe it will later, I don’t know, but it didn’t vanish on the spot like I expected. That’s a real bummer, but I don’t know what else to do. Maybe this gift of healing is a thing that grows as your faith expands. 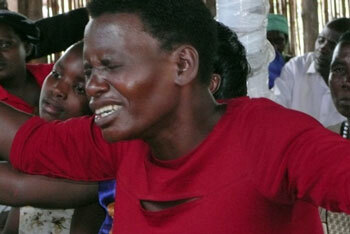 I hope so, because the look of desperate relief on the faces of the people who did get healed is priceless. Something huge happened in Kihihi. Huge. You could feel it in the air like something broke through some long established spiritual walls. Old theological ideas were smashed, personal wants were traded for a burden for lost souls, and a long ago buried faith that had been almost smothered by a mediocre church burst out of the grave and rose again in people’s hearts. They will never be the same … ever. Day 3 out here in Kumi was incredible, but Day 4 was flat. Oh, I guess the message was good and all that, but the fire and power just seemed to be missing. Maybe it was just me. I’m sure if you asked the people, they would tell you how great services was, but it sure wasn’t like yesterday … at least to me anyway. I struggled all the way to the hotel and into the night. Did I do something wrong? Maybe I got a little too cocky from yesterday’s services and just expected the power to be right there at my fingertips. After so many years of this, you’d think by now that I would have it down pat, but there is never a service that I go into that I am not nervous. I am constantly aware of how inadequate I am. Oh God, please send down the power! And He always does … just some days more than others. But there is always a message. Always. And it is always the right one. I think maybe I get so tense because so much is riding on it. I remember being told that mistakes in this business, unlike any other business, are fatal. Amen. We will make mistakes, but I don’t want to minimize them by just assuming that God will cover everything in the Blood just because. I’ve been reading some books from Leonard Ravenhill, and he really drives hard about prevailing prayer and intercessory prayer. It sure would be nice if I had some intercessory prayer warriors behind me – you know, the kind who travail in prayer through the night in agonizing battle to tear down strongholds. Yeah, we need some of them. As I was reading I realized that I don’t know anyone who is an intercessory prayer warrior, not even one! Maybe they’re somewhere in secret like Elijah’s 7,000. I sure hope so, because I could really use them to hold me up. Anyway, today was much better. 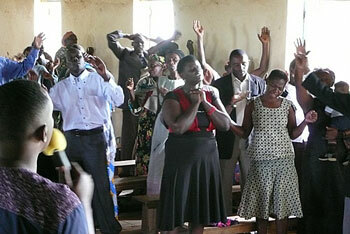 Yesterday, the pastors wanted me to anoint them with oil and pray over them. Today, the people in the congregation came up and wanted me to pray over them. This is serious, covenant-making, dedication-type prayer. They know they are taking a step that they cannot ever go back on, but they are serious about this and want it sealed with the anointing. And then, here comes the healing line … Some folks have come here from the last place I was at, the church out in the bush, and told them about the healings we had there. These folks want the same thing to happen here. It doesn’t seem that I have much of a choice in the matter, so we launched into it. I used be able to feel the anointing as it flowed through me into the people I prayed for. Sometimes it was like oil and sometimes like electricity, but lately I don’t feel it like I used to except every once in a while. That’s what it was like today. I prayed, I anointed, and they told me they were healed … but I didn’t feel anything! I wonder why I used to feel the anointing flow but don’t any more. (sigh) I guess as long as they are getting healed, what’s the difference? That is, as long as they are really getting healed and not just saying so for my sake. (There I go again questioning myself.) You go through a lot of tidal forces out here pulling you one way and then another. I guess that’s just the nature of the beast. But they did get healed and gave great testimonies of the fact. I think the difference with these people is that, unlike Americans, they just simply expect it, so it isn’t the great unexpected surprise that it is to us. They carry a simplicity about them that gives them the power to believe. Just about every day, the devil hits us with something new. Usually it’s the vehicle (which is what it was today), but Satan’s imagination is not limited to that. It’s always something. He can’t stop us, but he can sure vex and frustrate us. But the trick, I have learned, is to turn his attacks around on himself. So while I am stuck here at the hotel for 5 hours instead of being at the church preaching, I have decided to use this time that the devil has given me to storm the gates of Heaven for revival – right here, and right now! Revivals do not come without travailing intercessory groaning and desperate battles of prayer. I may not be an intercessor, but I do know that preaching without prayer is like the Meat Offering in Numbers 28 without that pure, beaten oil to anoint it – dry, tasteless, and ineffective. Yesterday, the anointing filled the church so heavily that the bishop could actually see the glow of the Anointing as I was preaching. He was so excited (I mean like jumping-up-and-down excited) that I had to call home to have him tell Cindy about it. I didn’t see it because I was busy giving the message, but I could sure feel it. It was the presence of the Shekinah Glory. He could actually see the glow. Souls got saved, pastors came up with broken hearts to be anointed and prayed for, and the congregation felt the Holy Ghost conviction to repent. We broke through and something great happened. I am now heading there for the 3rd session. The van is finally fixed – this time it was the radiator, yesterday the brakes, flat tires, engine, gas, etc. But we are on our way. Just like that ol’ Gospel song, “Praise God, I’m on my way to Canaan Land”. The bishop has brought me to a place that is about 8 km outside Kumi. It’s a fairly big place, but only has walls and a partial roof – no windows, no floor, no doors, nothing but a huge shell of a building. About 100 people have filtered in by the end of the day, and they’re expecting 300 people in the next day or so. African time is slow – there is no “hurry” in Africa. They’ll get here when they get here. The bishop I am with had a crusade here years ago and hundreds got saved. He says the Lord spoke to him to build a church here, not in the city. It is a pretty big church by Ugandan standards but it is only walls and a roof. The floor is made of hardened cow dung mixed with mud, which makes for a rock hard surface. There are no windows or doors, only openings in the walls. While it may seem crude, it works just fine. Africans don’t need anything fancy to worship God – a lesson we could learn from them. The landscape is identical to what I’ve seen throughout the country – dry red dirt with small brush interspersed with big Mango trees. Scattered throughout are little round huts made from mud bricks and straw roofs. It reminds me of the pictures I saw as a kid of the houses that the Three Little Pigs lived in.huge shell of a building. About 100 people have filtered in by the end of the day, and they’re expecting 300 people in the next day or so. African time is slow – there is no “hurry” in Africa. They’ll get here when they get here. I’m running through money like water. 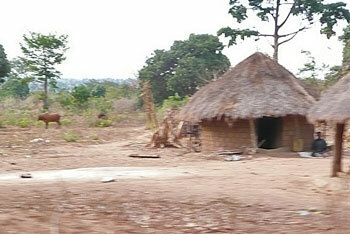 Because of the extreme poverty out here, I need to provide food and other necessities for these people. They come here with nothing and sleep on the ground in the church overnight. The van we’re using is old and beat up and we have to keep fixing one thing after another. (I should’ve just rented a car.) And Bibles are not cheap – IF you can find them. The language here is Ateso and the Uganda Bible Society won’t have any in that language for another 2 months, so if they can be found, it is only at the bookstores, and they are not cheap. And then there is always some unexpected expense that comes up. My challenge, however, is to break open their minds to grasp the enormity of what God is offering them. Just like most of us, our eyes and ears are so used to “church as usual” that we have a hard time grasping with total realization what the spiritual realities of Eternity are. Our ears are stopped and our eyes are dim because the fallow ground of our hearts is not broken through repentance. We don’t even know what to repent of, never mind that we even need to. Yesterday, the Lord pierced their hearts with passage after passage that emphasized that if we do not have mercy on the lost, we may not make it to Heaven. The idea of bringing forth fruit started with Rachael’s cry in Genesis 30:1 and continued on through the parables, including the Good Samaritan which very clearly states the answer to the lawyer’s question of how to gain Eternal Life. Simple. Win souls. Don’t pass by the wounded sinners like the Priest (Pastors) or the Levite (Church people) did in the parable. The True Vine, the Strait Way, The Church of Ephesus — on and on, the Scriptures came forward and pierced them to the quick of their souls. Simply put, if you say you want revival, pay the price! You say you want to go to Heaven? Win souls. If you don’t, your salt has lost its savor and you are good for nothing. They get it. In America, I’d probably be thrown out the door for accusing and offending everyone there, especially the pastors, but here they cheer and fall to their knees in repentance. That’s why revival will come here first, and then, if at all, maybe to America … if America repents. In order for this message to work, I have to preach under the anointing so that God can open blind eyes, open their ears, and pierce their hearts. We’re talking about bringing forth the Word that breaks the rock in pieces. Dear God, please, please, please, give me the power to preach your Word like you would preach it! Today will be my 2nd day here in Kumi. I have no idea what God will bring forth; I only know that He cares a lot more for these people than I ever could, so I guess it’s a safe bet to trust that He is going do what He is going to do. But I would sure like to have a REAL cup of coffee and a Big Mac. That would sure help a lot.